1) Will the open booking data be acquired quickly by the corporate traveler security system? This is a show-stopper for a lot of sites. 2) Will the consumer site provide cost-competitive prices? It depends, but why worry about a 2% discount on a $250 fare when there is a $10 or $20 transaction fee getting tacked on by the corporate channel? On the other hand, a 30% discount on a business class ticket makes it well worth booking via the corporate channel. 3) Will the traveler have a better experience on the consumer site? Not just the click-to-book steps, but will she get a better set of itinerary and ancillary choices? Think about where we are on this decision path. To get to this third question, we’re saying the data will be acquired, and the prices will be competitive. So now, why wouldn’t you want your travelers to have the freedom of using whatever booking tool makes sense to them? Keep in mind that for some travelers the answer will be the corporate booking tool. Great! 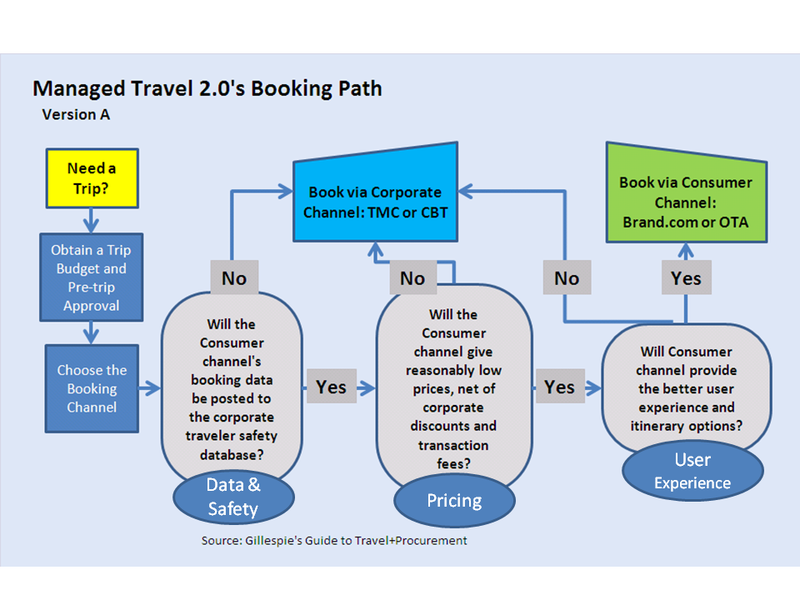 But if not, the principles of Managed Travel 2.0 say let your travelers roam free…subject to a few key constraints. Author’s note: Evan Konwiser contributes significantly to this series. Want articles like these delivered to you by e-mail? Follow this blog here. It’s free, and you can unsubscribe at any time. This entry was posted in Innovation, Managed Travel 2.0, Travel Management, Travel Policy and tagged Distribution, self-booking tool, Travel Technology, traveler-centric. Bookmark the permalink. Scott – This chart really helps me visualize Travel 2.0 as you have been describing it. It’s great. So, my question is – Question #2 – Is this determined by the channel itself (as in – the traveler generally gets lower prices all the time) or by the situation (The corporate channel gets better results for international flights to Europe, The traveler’s preferred channel gets better pricing for domestic coach flights, yet equal results for easter seaboard train fares on Amtrak). If it’s situational, who does the analysis, the traveler or the corporate Travel Manager? In other words – how does one know the right choice for #2? You raise a great question, Todd. I’d like to see it as situational, where the traveler always has the well-informed trip-driven choice between the two channels. I’ll take this up in more detail in my next post on this topic. It will cover innovation opportunities, including one for solving this very question. In my experience a well seasoned corporate traveler or procurement person will know what is reasonable and what is not when it comes to booking travel. Often they will know the travel policy as well as the individuals who wrote it. I have many corporate travelers that have permission to book outside the established corporate channel. If the booking meets predetermined parameters or just is a better value then what the current booking channel is offering the traveler is encouraged to book the fare. If the travel waits for corporate approval the fare most likely will be long gone. This kind of booking often works best for travelers that fly internationally looking business class air fare. In other words I believe in trust your employee to do the right thing. If not the privilege will be taken away. Tom, you nailed it – “Trust your travelers” sums it up. That said, we’d all agree that travelers need to be educated about the company’s expectations and the pros and cons of the two major booking channels. But once that’s done, then let ’em make their own decisions until they show they can’t be trusted. Regarding #2 above. How do you validate that the traveler in fact booked the $250 fare versus booking themselves on a $450 fare that allows for a free upgrade? Most corporate sponsored booking tools require the traveler to at least acknowledge the lower fare was offered and why it was refused. Airline sites or consumer sites, to my knowledge, do not capture are report on this type of information. So it may well be that the traveler chooses the $450 fare and lucks out with the upgrade. In the light of MT 2.0, the issue is simply whether or not his $450 fare is in budget, rather than making it a policy issue. You’re right to say that a consumer booking site would not flag the policy problem, nor capture a reason code. But that’s part of the MT 2.0 equation – giving up some control and visibility over stuff that is best managed by the traveler or his travel budget’s owner. South African market is still very much in the Managed 1.0 as some companies are still just aligning processes, redefining policies, identifying online booking tools etc. Managed Travel 2.0 will probably be seen in Global companies based in SA that are needing to align with global policies and processes, etc. Agreeable that this new way of travel will work in enviroments where reporting apps can accommodate such separately booked travel “outside the normal channels”. We most definitely seeing local online booking suppliers working hard to offer, expense management module to accommodate costs incurred outside “normal channels” as reporting and accurate data is important to the Travel manager. Thank so much for sharing your insights about the South African market. These perspectives from around the world really help us all to expand our knowledge and thinking. Much appreciated!